[Lat.,=cone-bearing], tree or shrub of the order Coniferales, e.g., the pine, monkey-puzzle tree, cypress, and sequoia. Most conifers bear cones and most are evergreens, though a few, such as the larch, are deciduous. , any plant of the order Cycadales, tropical and subtropical palmlike evergreens. The cycads, ginkgoes, and conifers comprise the three major orders of gymnosperms, or cone-bearing plants (see cone and plant). The cycads first appeared in the Permian period. tall, slender, picturesque deciduous tree (Ginkgo biloba) with fan-shaped leaves. The ginkgo is native to E China, where it was revered by Buddhist monks and planted near temples. minute grains, usually yellow in color but occasionally white, brown, red, or purple, borne in the anther sac at the tip of the slender filament of the stamen of a flowering plant or in the male cone of a conifer. ..... Click the link for more information. and each female-cone scale bears ovules in which egg cells are produced. In the pine, a conifer, the staminate cones are small and short-lived; they are borne in clusters at the top of the tree. At the time of pollination, enormous numbers of pollen grains are released and dispersed by wind; those that land accidentally on female-cone scales extend pollen tubes part way into the ovule during one growing season but usually do not reach the stage of actual fertilization until the next year. The cones that are commonly observed are the seed cones, which are normally hard and woody although in a few the scales are fleshy at maturity. The terms strobili and cones are also applied to the comparable and nonseed bearing structures of the horsetails and club mosses. , curve formed by the intersection of a plane and a right circular cone (conical surface). The ordinary conic sections are the circle, the ellipse, the parabola, and the hyperbola. ..... Click the link for more information. 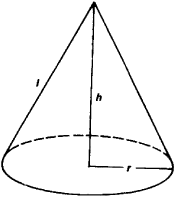 (e.g., a circle or ellipse) the cone is called a quadric cone. The most common type of cone is the right circular cone, a quadric cone in which the directrix is a circle and the line drawn from the vertex to the center of the circle is perpendicular to the circle. The generator of a cone in any of its positions is called an element. 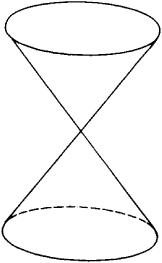 The solid bounded by a conical surface and a plane (the base) whose intersection with the conical surface is a closed curve is also called a cone. The altitude of a cone is the perpendicular distance from its vertex to its base. The lateral area is the area of its conical surface. The volume is equal to one third the product of the altitude and the area of the base. The frustum of a cone is the portion of the cone between the base and a plane parallel to the base of the cone cutting the cone in two parts. of the second degree not lying in the same plane as the vertex, then we obtain a quadric conical surface (see Figure 1, where the directrix is an ellipse). The simplest surface of this type is a circular, or right circular, cone, whose directrix is a circle and whose vertex can be orthogonally projected to the center of the circle. (2) In elementary geometry, a circular cone is a geometric solid bounded by the surface of a circular cone and the plane containing the directing circle (Figure 2). Its volume is equal to πr2h/3, and its lateral area to πrl If a cone is cut by a second plane parallel to the first, a frustum of the cone (Figure 3) is obtained, whose volume is equal to π(R2 + r2 + Rr)h/3 and whose lateral area is π(R + r)l.
The ovulate or staminate strobilus of a gymnosperm. The cone-shaped paper or fiber diaphragm of a loudspeaker. A mountain, hill, or other landform having relatively steep slopes and a pointed top. A photoceptor of the vertebrate retina that responds differentially to light across the visible spectrum, providing both color vision and visual acuity in bright light. A solid bounded by a region enclosed in a closed curve on a plane and a surface formed by the segments joining each point of the closed curve to a point which is not in the plane. The part of an oxygen gas flame adjacent to the orifice of the tip. A bobbin on which yarn is wound for weaving. A free-rotating fabric-truncated cone that when subjected to air movement indicates wind direction and wind force. On approach charts, the wind cone is shown as. Also called a cone, sock, or wind sock. b. a similar structure in horsetails, club mosses, etc.